Item number Na1578 from the MOA: University of British Columbia. Painting of five stripes in baby blue, dark brown, light brown, dark blue, and white. 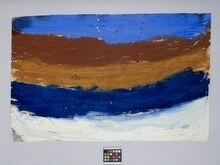 The painting is on horizontally rectangular, brown paper.